'The Illicit Love of a Courtesan' is Ellen's poignant battle to overcome the abuse she suffered after husband's death at Waterloo. Her emotional rebirth necessitates self-forgiveness and trust of others before she accepts the love which will restore her humanity and self-worth. Numerous obstacles plague her life in the form of cruel men and society's unforgiving strictures. To find her happy ever after she must harness her fears and conquer these. Edward a second son has lost his life motivation after the return of his elder brother to reclaim his legacy which has prospered under Edward's stewardship. Wiling his time away in a notorious gaming hell he notices and ultimately has an intimate liaison with Ellen a courtesan who he wins for a couple of hours when he calls her protector Gainsborough out for cheating. The passion ignites between them and even though she belongs to another Edward cannot forget her. He seeks her out and they enjoy and illicit week of passion whilst her protector is away. On Gainsborough's return he threatens Ellen with her worst nightmare and she runs to Edward the only one who can save her. Full of angst this story draws you in as soon as the gravity of Ellen's situation is evident. Edward is a true hero willing to protect his lady against all evils and able to forgive her even when she lies. 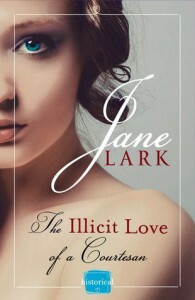 'The Illicit Love of a Courtesan' is an emotional romantic story which gives an excellent insight into the vulnerability of young women in Regency society.